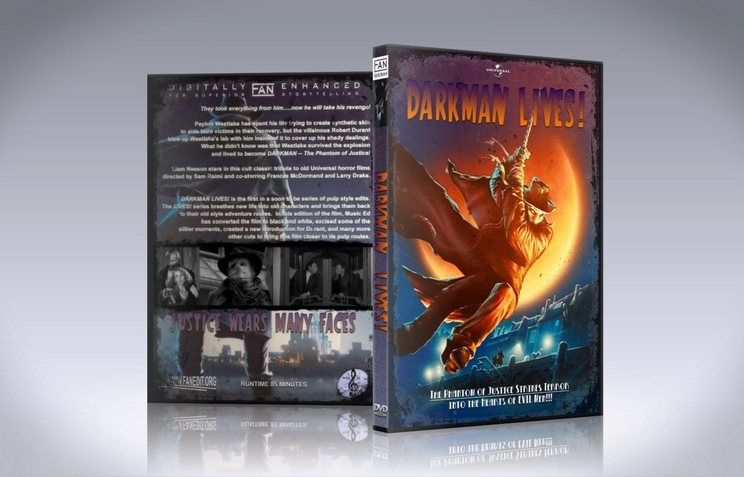 Database Fanedit Listings FanFix Darkman Lives! The Phantom of Justice strikes Terror into the Hearts of Evil men!!! Something about the movie Darkman has always been a little off to me. It had a lot of potential and I wish Sam Raimi continued to build on it, but it was a weird mix of horror, comedy and superhero elements that didn't quite gel with this particular character. The film plays like what it would be like if you had a modern Phantom of the Opera superhero, so I embraced that approach and tried to bring it closer to that feeling. - Cut funeral. We fade to black after explosion, lingering on Julie. The transition from the explosion to the funeral always looked corny to me. There's nothing really important about the funeral part other than that they couldn't find Westlake's body. - Cut Westlake seeing Julie on the street. - Trim a little of Westlake going mad in his lab yelling at the cat. No more song and dance. - Cut Julie saying she doesn't know about being with Peyton if he was scarred. That didn't resonate well with me. - Edit carnival scene. No more rubber fingers. - Cut "you've got to be shitting me!" - Cut "you've been a bad boy!" - Trimmed Darkman on top of truck that Durant drops him on. Durant doesn't continue to fire aimlessly and it takes too long for Darkman to hook onto truck. - Cut Bruce Campbell cameo. We now end after Julie can't find Westlake with a nighttime shot of the city and Darkman standing on a rooftop looking out at the city as he does his "I am Darkman" speech. The shots for this were lifted from Darkman II. Very superhero-ish. 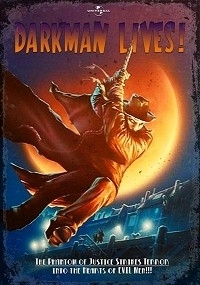 Being a huge fan of Raimi's version of Darkman, I was very interested in seeing an alternate cut. Overall, many of the changes are not immediately noticeable. I say that as a positive. Most of the cuts work and I really enjoyed the change to black and white. Are suggestions supposed to be made here? I'm still new. I think you did a great job, tightened up some parts and the continuity fixes were definitely welcome. I think cutting the funeral was a wise choice, however, I think a longer hold on the black screen could be more effective. That felt a bit abrupt. The only other thing that I remember (because, again, I really enjoyed this) was cutting Peyton seeing and approaching Julie on the street. It was an emotional scene that was handled well and I don't think seeing the building, instead, really gives him the motivational push being unable to communicate with Julie did. Again, I really enjoyed this version and I look forward to trying out more, in the future. I first saw Darkman as a first run theatrical with en exceedingly rowdy audience. Shouting at villains, cheering mayhem, really into payback and retribution. This experience coloured my memories, causing me to overlook problems that were more apparent when I bought LD and DVD of the film. Chief was director Raimi’s misuse of silliness and goofy behaviour. MusicEd921 trimmed the nonsense and more. Video - 1920 X 1080p. The black n white definitely adds to the 30s look the editor was striving for. Exteriors were sharp, interiors, especially Darkman’s warehouse laboratory were soft. Night time saturation was fine. There was one editing quibble I had in a preview, which the editor rectified. Editing is smooth throughout. Audio - 160 kbps, 2 Channel AAC. No subs. There were music alterations and special effects added. Nicely done. Dialogue is clear. No audio problems that I could hear. Narrative - Trims were minimal, so the plot changed little. The tone, however, differs greatly. By design, this edit brings to the fore the pulpy elements. Violence is toned down. The love angle, which was clunky to begin with, seems trimmed as well. The weird sequences when Westlake hallucinates are heavily truncated - to the better. This is a PG, popcorn experience. While violent, it should be OK for older children. Enjoyment - Yes ... but ... this was a fun film, though not as dark as before. I think I would have preferred a rougher ride. That said, MusicEd921 was upfront is declaring this would be a pulpier, lighter version. He delivers. Bad guys, Durant and Strack, still have voices too high to feel menacing. An excellent version. And if you want action, yet want to avoid obscenities and gore, this is a great choice.